The Nautilus Rolling Shutter System is a state of the art end-retention shutter featuring the most compact housing sizes in the world. Snap covers are utilized to conceal all fastening hardware. 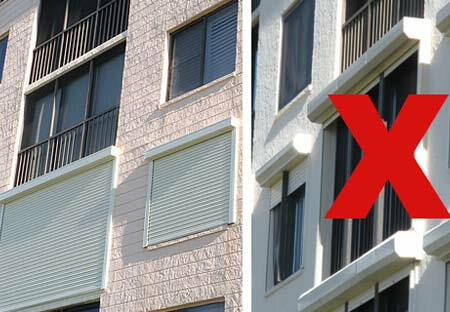 Home and business owners alike can now utilize the Nautilus Shutter, where previously, the space available would not accommodate a roll shutter. The size of the housing will no longer detract from the appearance of the building. The Nautilus can be electrically operated with the use of a wall switch or a hand held remote control capable of operating twenty shutters from a single remote. Shutters can also be manually operated with the use of a removable crank or hand operated where they can can be pulled up and down. Nautilus is extremely versatile and can be utilized where other systems fall short. Available in four colors; White, Ivory, Bronze and Beige. 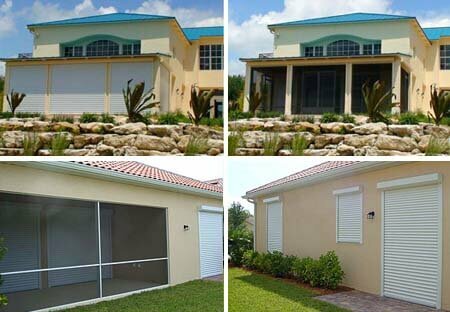 The Nautilus Rolling Shutter System has a variety of uses including: hurricane protection, storefront, security and counter top applications. Nautilus Shutters are permanently attached, easy to operate and deploy quickly. No put up, take down or storage required. The Nautilus is ideal for use in protecting large patios and balconies. They are built to protect your most valuable asset and its contents. Every component of the Nautilus Shutter has been designed for increased durability and longevity, even in the harshest of environments. Rigorous fatigue tests are performed for up to 20,000 cycles. These tests are used to evaluate the integrity and dependability of each and every component. We make certain these components and the entire system will perform consistently year after year. Nautilus Shutters undergo extensive and rigorous testing, including large missile impact tests, and are Florida Building Code approved for Non-High Velocity and High Velocity Hurricane Zones (Dade and Broward Counties). A series of forced entry tests are also performed for security protection. Nautilus has the ability to span over twenty feet in width without any intermediate support or storm bars. All aluminum components including slats, side rails, axles, housings and end caps are fabricated from 6063 T-6 extruded aluminum alloy. All fasteners and assembly hardware are made from 316 or 410 series marine grade stainless steel. The end-retention bushings are made of high performance acetal polymer. Nautilus Shutters are designed and manufactured to the absolute highest standards in the industry. The unique, patented design of the Nautilus Rolling Shutter System provides many new features and benefits. Combined with increased strength and versatility, this shutter is in a class of its own. (US Patent numbers 6,095,225 and 7,409,980). The Nautilus is the world’s most compact rolling shutter system! No other aluminum rolling shutter can match the extraordinarily compact housing sizes. CLICK HERE TO REQUEST A FREE NO OBLIGATION QUOTE TODAY!